We added a new feature to GroupMail Business Edition v.6.0.0.8 and above which allows you to call and execute a stored procedure you created in your database. You may choose to write your stored procedure in your database to have it return the data to a new table, or to append an existing table you have in your database. Here are some example stored procedures for each of the 3 functions listed above. Again these are only examples so you would use table and field names that match your own database. 3) On completion of send (date, total sent, total failed, total filtered/excluded). Once you have created your stored procedure, you can simply call that stored procedure from GroupMail. 1) Create a new Database connected Group or modify and existing one. 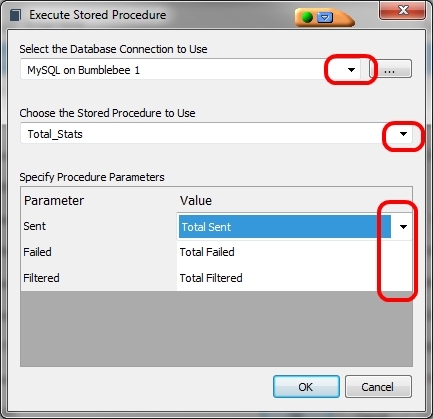 2) You will see an “Options” tab as in the screen shot below and you are given the option to execute any or all of those three stored procedures depending on what stored procedures you have created in your database. 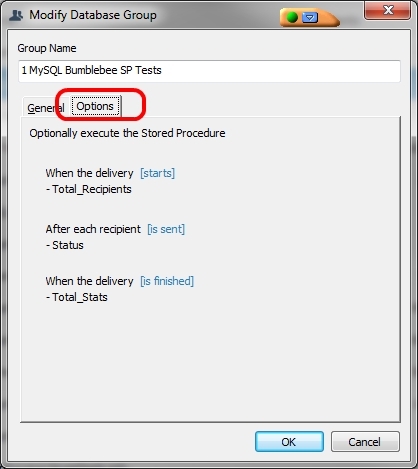 3) Click on the blue text between the square brackets [ ] to select your stored procedure to execute. Here you can choose the options such as selecting which database to use, the stored procedure to run and the parameters to return to your stored procedure. Click OK. Now when you send to that Group your database will be updated with the delivery stats from your send.